An extremely rare photograph of Tokyo’s Nihonbashi (日本橋) area as seen from Yaesu (八重洲), ca. 1870s. The canal is Sotobori (外堀), which was filled in around 1955 (Showa 26). The bridge in front is Gofukubashi Bridge (呉服橋). The bridge slightly to the right in the background is Ikokubashi Bridge (一石橋). The bridge on the far left is Tokiwabashi (常盤橋). The large Western building on the far right is Mitsui Youkan (駿河町三井洋館) in Nihonbashi’s Suruga-cho (駿河町). 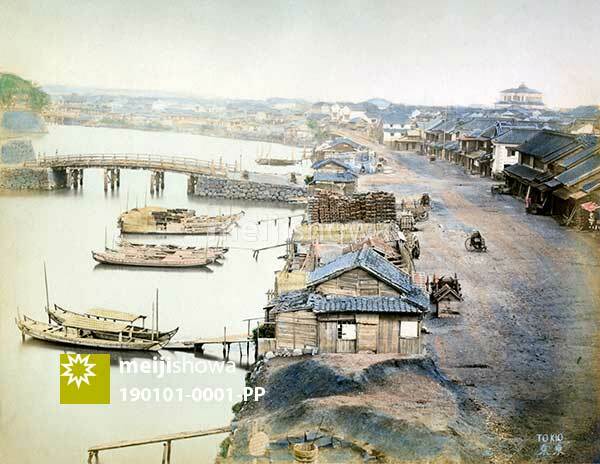 The Mitsui Youkan was completed in 1874 (Meiji 7), so this photo dates from after that date.